After missing three of his past four cuts, nearby Augusta-native Kevin Kisner got hot and put together his best showing of 2018. Kisner got to the finals by knocking off Matt Kuchar, Ian Poulter and Alex Noren before running out of gas in the final. Kiz was fantastic in his semifinal match against Noren, which went to extra holes after the pair exchanged a pair of 5-under 67's. Perhaps the most impressive performer of the week was 3rd place winner, Alex Noren. The Swede swept his pool and was dominant from tee to green. During his seven matches, Noren only made four bogeys despite heavy winds and a golf course filled with hazards. Noren heads into Augusta in top form with a runner-up, two third-place finishes and three other top-25 finishes in seven starts on the PGA Tour in 2018… sleeper alert. Had Justin Thomas beaten Bubba Watson in their semifinal match, he would have ascended to number 1 in the world rankings. While not number 1 yet, Thomas' all-around excellence makes him the most complete (and I believe best) player in golf. Following his round of 16 win over Louis Oosthuizen, Ian Poulter was informed by officials that he had played his way into the top 50 of the world rankings, earning a spot in the Masters. It turned out, however, that there had been a miscalculation. Poulter (understandably) vented on social media about the mistake and will now likely miss the Masters. Perhaps Will Knights put it best. It's a love/hate relationship, me 'n the WGC Dell Match Play. Here's what I liked and didn't like from the last week in Austin. Bubba's lone lowlight of the week. In his first appearance in the match play event, budding Aussie star Cam Smith and potential U.S. Ryder Cupper Brian Harman was impressive, advancing to the round of 8 and 16. Matt Kuchar raises the roof following a hole in one. Dustin Johnson set the unofficial PGA Tour record for longest driver after hitting it 489 yards on Friday. It's unofficial because match play events don't count… lame. We are a mere seven days from the best week of the golf season. To refresh everyone's memory and get you excited about the year's first major championship, Will Knights ranked and retold the last 10 Masters. 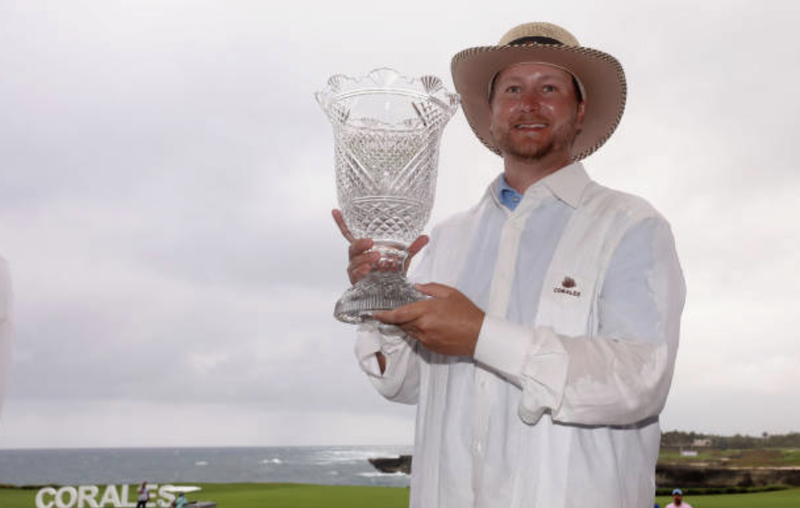 The bottom half of the PGA Tour was in the Dominican Republic for the Corales Puntacana Championship, where Brice Garnett ran away for a four-shot win. The veteran Garnett's win comes after spending last season on the Web.com Tour, where he won twice to re-earn his card. For his win, Garnett earns a two-year exemption on Tour and, most importantly, got to dress up in this outfit. Illinois won the biggest tournament of the weekend with their victory at the K-State Bighorn Invitational. All-Americans Dylan Meyer and Nick Hardy finished in the top six, and fellow Illini Bryan Baumgarten won individually. This win is big for Illinois as they have struggled to find their top form this year. There are limited events left this year and this win helps them gain traction heading into the postseason. North Florida also won the Furman Intercollegiate this past weekend. UNF had the top three finishers and ran away with the team title. This is the Ospreys’ first victory of the season. This college season has been dominated by large universities, but UNF is one of the mid-majors to watch this postseason. Julian Etulain fires a 4-under 67 to win the Web.com Tour's Chitimatcha Louisiana Open. Shackelford explains why this week's Houston Open is likely the last. If you are looking for some golf course architecture books, here's a good list for the beginner and the obsessed.